1805 ~ 1823: he started his career as a disciple of Arashi Koroku IV, who gave him the name of Arashi Hinasaburô and trained him as a wakaonnagata actor. Winter 1823: Arashi Hinasaburô took the name of Arashi San'emon IX in Kyôto. 9th ~ 10th lunar months of 1826: tour in Nagoya with Onoe Kikugorô III, Nakayama Shinkurô IV and Onoe Matsusuke III. 11th lunar month of 1826: his master Arashi Koroku IV died. Summer 1837: tour in Nagoya with Arashi Kanjûrô I and Jitsukawa Enzaburô I. Winter 1837 ~ 1838: short stay in Edo; San'emon performed at the Kawarasakiza. 1st lunar month of 1851: San'emon's rank in the Kamigata hyôbanki, wakaonnagata section, was jô-jô-kichi (superior - superior - excellent). 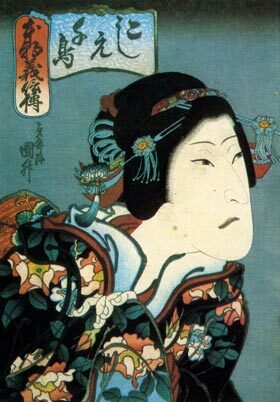 3rd lunar month of 1851: San'emon played at the Naka no Shibai the role of the courtesan Azuma in the drama "Hanazumô Chôchô Monjitsu", similar to "Futatsu Chôchô Kuruwa Nikki". 5th lunar month of 1851: San'emon played in the same theater the role of Osono in the classic "Kanadehon Chûshingura". 3rd lunar month of 1852: San'emon played in the same theater the roles of Princess Chigusa and Hayase in the drama "Hana Kaede Ogura no Shikishi". 11th lunar month of 1854: San'emon played at the Minamigawa no Shibai the role of Osan in Chikamatsu Monzaemon's drama "Daikyôji Mukashi Goyomi"; the role of Mohê was played by Jitsukawa Enzaburô I. 1st lunar month of 1855: San'emon's rank in the Kamigata hyôbanki, wakaonnagata section, was hakushi-jô-jô-kichi (almost unique - superior - superior - excellent). 2nd lunar month of 1855: San'emon played the role of Shizuka Gozen in the classic "Yoshitsune Senbon Zakura", which was produced by the zamoto Arashi Kitsunosuke at the Chikugo no Shibai; his stage partners were Arashi Rikaku II (Satô Tadanobu, the fox Genkurô, Kokingo and Kajiwara Kagetoki) and Ichikawa Ebijûrô IV (Tokaiya Ginpei, Taira no Tomomori, Igami no Gonta and Yokawa no Zenji Kakuhan). 11th lunar month of 1858: San'emon appeared on stage for the last time, in Kyôto at the Minamigawa no Shibai. 16th day of the 3rd lunar month of 1859 : San'emon died. Arashi San'emon IX was a good wakaonnagata actor, who spent most of his career in Kamigata. Keisei roles were his forte. Arashi San'emon IX and his adopted son Arashi San'emon X were recorded in Nojima Jusaburô's book "Kabuki Jinmei Jiten" as Arashi Minshi I and Arashi Minshi II. The 16th day of the 3rd lunar month of the 6th year of the Ansei era was the 18th of April 1859 in the western calendar.